This machine is with idler wheels and needle are used at the same time to feed materials of Direct drive heavy duty post bed Lockstitch Sewing Machine, strong slope climbing force, little change of needle gauge. Sponge, thin leather and other materials can be sewn. 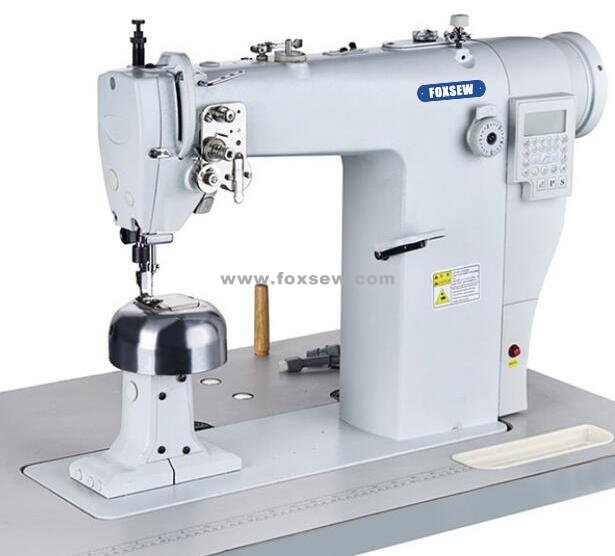 FX-810DH Direct drive heavy duty post bed Wigs sewing machine is well-distributed, Wrinkle free, no deformation, little attrition, low noise and long life.FOXSEW Direct drive post bed heavy duty lockstitch sewing machine is suitable for sewing riding boot, sports shoes, casual shoes, sponge shoes, baby`s shoes, high grade leather shoes and all kinds of luggages. Looking for ideal Post Bed Sewing Machine Manufacturer & supplier ? We have a wide selection at great prices to help you get creative. All the Post Bed Wigs Machine are quality guaranteed. We are China Origin Factory of High Head Wigs Sewing Machine. If you have any question, please feel free to contact us.